On Friday Chris tweeted about some HRT - half rectangle triangles - that she was making. 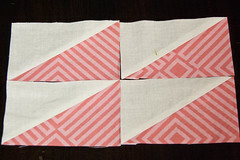 She lined up 2 rectangles, sewed 1/4" from the diagonal like you would with HSTs and came out with lovely kites! Unfortunately she wasn't after kites. :( So on Sunday morning she woke me far earlier than anyone without kids would ever wake up to ask for my help. The diagrams I sent her were not quite this nice (since I had just woken up), but they were along the same lines. 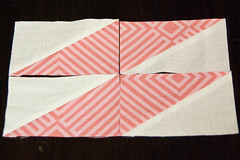 For my samples I started with 5" x 3" rectangles and ended up with 4.25" x 3.5" rectangles. Here are some layouts I was playing with. 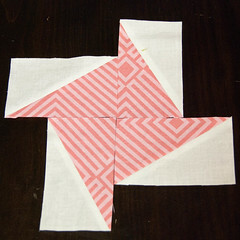 The aren't as versatile as HSTs, but I think they could make a cool design. hehe... I totally sleep til 10am on Sundays *ahem* at least til 10am. My sister (who has a newborn) & my best friend (also with a newborn) are really bad at knowing that just because they have been up for hours, doesn't mean that I have been! Sister: Hey, I'm bored...wanna go do something? Also, someone waking me up to do MATH/mathy type figuring? That would so not go well...I need at least 1 cup of coffee to spell my name correctly! Oh yes, the coolness is strong with these ones! Very cool! I'm glad you and Chris live close now. 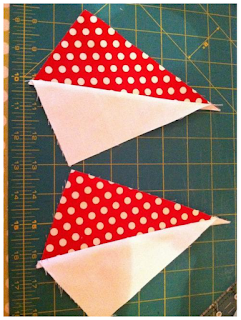 How fun to have a super crafty person near (and that goes for both of you!). I love the design on the bottom right corner. But I'm puzzled. Shouldn't you end up with something smaller than 3"? I experimented with this and I ended up with something more like a 2 1/2" or 2 5/8" x 4 1/4" rectangle instead of 3 1/2' on that one side. 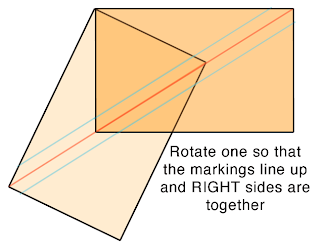 If the seam goes right through the corner, then the seam won't go through the corner when they're pieced together because the angle isn't a 45 degree angle. 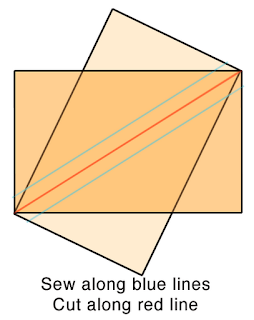 I'm wondering how you might decide how to square them up to make sure the corners do what you want? 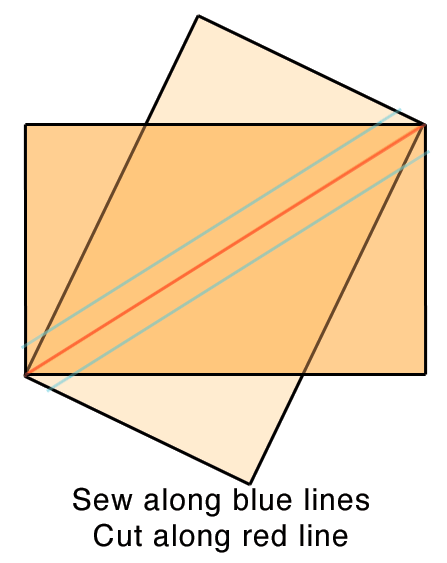 I do similar, but only mark the middle line and use That Patchwork Places BiRangle template to "rectangle" or square them up. Yes, you need to be very careful or the final blocks will look very rough. 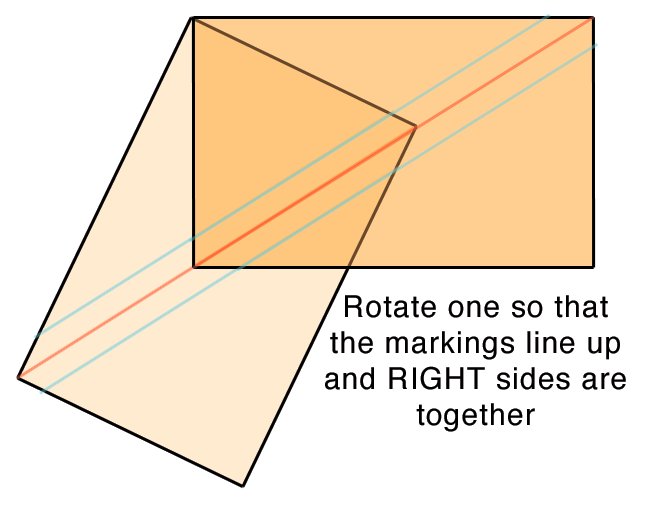 The BiRangle is wonderful but only works for rectangles with side ratio 2:1, which is usually preferable. These rectangles neither started nor finished 2:1. 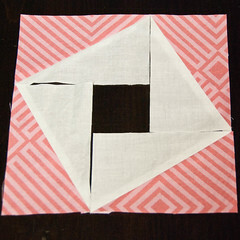 Cool idea but will try to work out a construction that won't result in the points being cut off when pieced together.....the challenge for the day!!! LOL!! !